Cardio Debate > Cardio Notes > Treatment and Prevention > Hypertension treatment – Lower not always better! 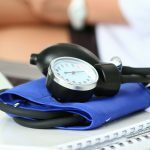 Hypertension treatment – Lower not always better! A recent publication in The Lancet by Vidal-Petiot et al (1) reported that a reduction of blood pressure (BP) to levels in the region of 120–139 mm Hg systolic or a 70–79 mm Hg diastolic for a period of >5 years in patients with hypertension and stable coronary artery disease resulted in improved rates of non-fatal and fatal cardiovascular events including stroke. Of interest, however, in their patients (CLARIFY registry), a J-curve effect was noted as BP reductions to < 120/70 mm Hg, were associated with a significant increase of cardiovascular risk. The authors assessed over 22,000 patients with stable coronary artery disease enrolled in the multinational CLARIFY registry, who were receiving treatment for hypertension. As described by the authors “Systolic and diastolic BP before each event were averaged and categorised into 10 mm Hg increments”. Study primary outcome was the composite of cardiovascular death, myocardial infarction, or stroke. Hazard ratios (HRs) were estimated with multivariable adjusted Cox proportional hazards models, using the 120-129 mm Hg systolic BP and 70-79 mm Hg diastolic blood pressure subgroups as reference. Main findings were as follows: “After a median follow-up of 5·0 years, increased systolic BP of 140 mm Hg or more and diastolic BP of 80 mm Hg or more were each associated with increased risk of cardiovascular events. Systolic BP of less than 120 mm Hg was also associated with increased risk for the primary outcome (adjusted HR 1·56, 95% CI 1·36-1·81)”. Of importance, diastolic BP < 70 mm Hg was associated with “an increase in the primary outcome (adjusted HR 1·41 [1·24-1·61] for diastolic BP of 60-69 mm Hg and 2·01 [1·50-2·70] for diastolic blood pressure of less than 60 mm Hg)”. The findings reported by Vida-Petiot et al (1) are not unique as several other trials (albeit mainly on post-hoc analyses) have reported similar J-curve trends. (3) A possible explanation for findings in this recent trial (1) is that low BP in patients with severe CAD could have favoured the occurrence of myocardial ischaemia via reduced coronary blood flow supply. There are no obvious reasons for the J-curve in the Vidal-Petiot study apart from myocardial reduced perfusion due to low BP levels, as risk factors and CV risk were comparable in patients on both arms of the J curve. Another interesting aspect of the study is that in the elderly, CV risk did not increase until BP readings were above 150 mmHg systolic BP. This finding endorses current recommendations that systolic BP targets do not necessarily have to be <130 mmHg systolic. As recently discussed by Mancia et al. in a previous publication (4) and in a recent editorial article (5) “this is important because low blood pressure targets markedly increase the incidence of treatment-related side-effects”, leading to the discontinuation of therapy and undesirable outcomes in many cases. (6) Whatever the mechanism responsible for the J-curve in the study, these findings should make physicians think carefully in which patients pursuing target BP levels as suggested by the SPRINT investigators -who advocate a low target BP for risk reduction- (2) would be appropriate. At least in hypertensive CAD patients marked reductions in BP may not be desirable. The study, carried out by E. Vidal-Petiot et al., and recently published in the Lancet, draws attention to two topics that have been much discussed in the past and are still currently being debated: the blood pressure (BP) target to be reached and the phenomenon of the J-curve. The study findings - which analysed the vast number of patients with stable coronary artery disease enrolled in the multinational CLARIFY registry - seem to confirm the pressure targets suggested by the latest American and European hypertension guidelines. The finding that below 120/70 mmHg there is a significantly increased cardiovascular risk or risk of treatment-related side-effects, proposes yet again a comparison with the SPRINT study. In this much-mentioned, and much-disputed trial - it is one of the studies that have had the greatest number of comments in scientific journals - aggressive treatment in high-risk patients improved the cardiovascular prognosis compared to a standard treatment, but also increased the incidence of adverse events especially for the elderly. Were we to extrapolate data from the primary composite end-points, (and, I distrust composite end-points) the benefit for IMA does not reach any statistical significance. The data that seem to confirm the existence of J-curves are of far more interest. So far, the problem has remained unsolved despite numerous works on the subject: some favorable, many against. The phenomenon is relevant only in the case of the treatment of hypertension and should not be confused with low levels of BP in patients who are basically compromised (neoplastic diseases or chronic diseases) or with failing left ventricle or arterial stiffness. I believe that the phenomenon of the J-curve - more important for the heart than for the kidney or cerebral circulation, and responsible for serious and/or fatal cardiovascular events - applies only to severe coronary artery disease and stenosis that create severe gradients. A worsening element of reduced myocardial perfusion is the presence of ventricular hypertrophy. In any case, the fact is not to accept (or not) the existence of a J-curve, but which is the point J, which certainly exists, for both the DBP (the main point of discussion), and for the SBP (less considered , but with a involvement, even if it is dubious). With regards to DBP, I do not believe there is a precise cut-off, as reduction of the DBP to "acceptable" values in the presence of favoring conditions such as anemia - and others that favour an increase in the need of oxygen by the myocardium - may induce adverse events (e g. the reduction of angina threshold). Moreover, in certain conditions, such as ectasiac coronary disease or the presence of a thrombogenic trend, a reduction of the perfusion pressure can promote the formation of thrombi and therefore hard acute events. However, I think it is wise not to go below 70 mmHg. With regards to SBP, numerous studies have expressed very variable values, at times high; probably for certain types of patient it is preferable not to fall below 120 mmHg. Since SBP is a more important risk factor for cardiovascular events, possible J-effect curves can be taken less into consideration. We must beware that this message does not worsen current existing physician inertia, resulting in patients being undertreated and that the adverse effects of a too-low BP does not reduce the patient’s therapeutic adherence. It is simply a question of avoiding over-treating hypertensive patients by using less aggressive treatments and using more moderation. It is the patient who must be taken care of and every patient is different. I never get tired of advising to be more daring with low-risk and more cautious with higher-risk patients. A target blood pressure below 140/90 mm Hg for most patients with uncomplicated hypertension is generally well accepted. The optimal blood pressure level for patients with high or very high cardiovascular risk, however, remains controversial. In patients with type 2 diabetes mellitus (or with impaired fasting glucose or glucose intolerance) circumstantial evidence suggest that target blood pressure may be 130-135/80-85 mm Hg [1-3]. With further blood pressure lowering there seems to be an additional benefit against stroke, whereas side effects and the risk for coronary artery disease events will increase [1,2]. Thus, there is little additional benefit on total cardiovascular events in diabetic patients below about 130/80 mm Hg. The case is less clear in patients with hypertension and concomitant coronary artery disease. Most evidence is derived from post hoc analyses, where incident cardiovascular events were associated to blood pressures achieved in the context of the studies. However, available evidence suggests a J-shaped relation between achieved blood pressure and new acute coronary artery disease events [1,2,4]. In confirmation of previous post hoc analyses [5-7], the recently published observational results from the CLARIFY registry on patients with treated hypertension and coronary artery disease  show a J-shaped relation and suggest a blood pressure below 120/70 mm Hg to be associated with an increased risk for events. Thus, available evidence suggests that different cardiovascular outcomes may have different target blood pressures. There is sufficient evidence to recommend a target blood pressure below 140/90 mm Hg in most hypertensive patients. However, patients with advanced coronary artery disease may be at risk with very low achieved blood pressure values. Thus, in patients with high or very high risk such as diabetes mellitus, chronic kidney disease, and patients with previous cardiovascular events, it is reasonable to aim for a target blood pressure of 130-135/80-85 mm Hg, although less well supported by solid trial evidence.